Field Notes: Piennoli at Meadow’s Mirth! 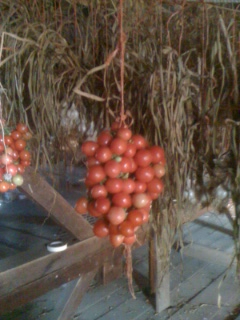 Just in from the amazing farmers at Meadow’s Mirth in Stratham, NH — bellisimi! They grew out the Principe Borghese from several sources, and also the grappoli. Thank-you Josh and Jean for helping to make these happen! If you’ve been wanting to sample some of these tomatoes, both Meadow’s Mirth and Stout Oak Farm have been bringing loose Principe Borghese and grappoli that are ready to eat to the farmers’ markets — great for slow roasting, drying, canning, and cooking into fresh pasta sauce. Meadow’s Mirth has them at the Portsmouth and Exeter Farmers’ Market, as well as their farm stand. Stout Oak Farm can be found at the Durham, Exeter, and Epping Farmers’ Markets.